HM Coastguard paged LNR at 10:09hrs and requested the immediate launch of the Kinnego and Ardboe lifeboats to the aid of 2 persons on board a dredger that was taking on water in the area of Skaddy Tower. Both lifeboats launched swiftly and proceeded to the area, whist on route it was confirmed that the vessel was no longer afloat and the casualties were in the water. The lifeboat arrived on scene where one person had made it on-board a sand dredger that was nearby. The sand dredger and fishermen who were also in the area proceeded to the casualty vessel following the call that they were taking on water and sinking. With the other person still in the water (alongside the sand dredger), LNR crew boarded the dredger and along with those on board retrieved the person from the water. 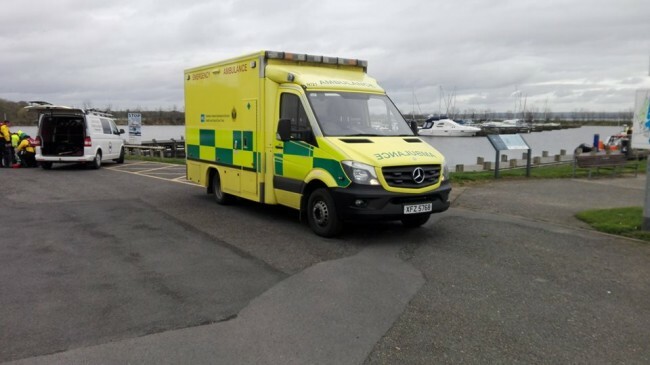 Both casualties were treated for cold water shock, transferred to the lifeboat and brought to Ballyronan marina where LNR shore crew were awaiting with the Northern Ireland Ambulance Service. The casualties were brought safely to shore and handed into the care of the NIAS for treatment. Large debris from the area was also brought to shore ensuring the area was safe for other vessels before the lifeboats were stood down and returned to base. We would like to acknowledge and thank those on-board the nearby fishing vessel and sand dredgers who came to the aid of the casualties. Their swift actions undoubtedly reduced the risk of loss of life.